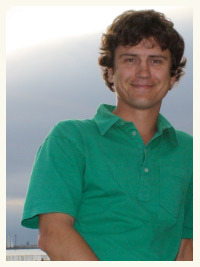 Ryan McEvoy is a green building consultant and a certified permaculture designer who has been working on sustainable projects around the world since 1999. Currently Ryan is the founder and principal of Gaia Development, a consulting firm located in Los Angeles, CA which focuses on energy efficiency and sustainability consulting for real estate developers. Previously Ryan served as project manager and sustainability coordinator for Yorkshire Development during the design and construction of the Tricom Building, the first LEED® (Leadership in Energy and Environmental Design) certified speculative building in the U.S., in Pasadena, CA. Through this project Ryan was able to introduce LEED® to city officials in his hometown of Pasadena, CA. Ryan has also worked with several nonprofits, namely Peace Works International, a Los Angeles-based organization which hosts educational trips for high school students to Central America. He has taught workshops for the Los Angeles Department of Water and Power, the City of Los Angeles Planning Committee, as well as numerous universities, conferences, and local community organizations on a range of topics related to sustainable building practices and codes. Ryan is committed to the belief that community action and education are the keys to creating social and environmental change.